Generate is heading to Australia for the first time; here's why you absolutely don't want to miss it. There's less than a month to go until the net magazine and Creative Bloq's Generate conference hits the southern hemisphere for the first time. On 5 September, Generate Sydney will be kicking off at Doltone House Hyde Park, and it promises to be an unmissable event for anyone working in web design or frontend development who wants to stay at the top of their game. You can book your ticket right now; here's why you'll want to get on the case. We've lined up a top-notch roster of speakers for our first Australian event. Cameron Adams, Mark Zeman, Erika Hall, Val Head, Jonathan Snook, Nick Finck, John Allsop and Zoe Mickley Gillenwater will be bringing their combined wisdom to Generate Sydney, providing practical advice and inspiring insight across a range of hot web topics. If you want to ensure that you're offering your clients the most up-to-date services then this is the place to be. Over the course of the day you'll be brought up to speed on some of the latest techniques for creating the best online experiences, including designing web animations, responsive web apps, analytics, CSS flexbox, UX and more. Ever found yourself torn between two equally appealing conference sessions happening at the same time? That's not a problem at Generate Sydney; it's a single-track programme, which means you'll be able to attend all the sessions without missing out on anything. Don't go hungry! As well as refreshments during the day, you'll be able to grab a delicious lunch at Generate Sydney, and then head off to a free 20-minute workshop so that you can get in some extra learning. You can spend the day with your head down, taking notes if you want, but that's not necessary; once the event is over we'll be making the speakers' slide decks available, so that you can review them at your leisure once you get home, rather than try to make sense of pages of scribbled notes. 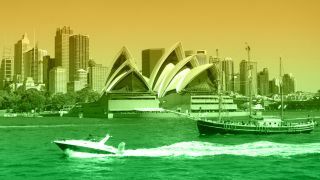 As well as a top line-up of speakers, Generate Sydney also offers a great opportunity to forge new contacts. Whether it's during one of the session breaks, or later on at the post-conference happy hour, it's the perfect chance to meet other web professionals and expand your network. This is our first Generate conference in Sydney, which means that if you come along you'll automatically become a Generate founding member, earning 50 per cent off ticket prices for all our future conferences worldwide, for life! The web industry moves fast, and if you're not offering up-to-date services then potential clients will seek out other studios and agencies that do. Generate is the perfect place to re-up your skill set and get insight into where you should be focusing your efforts for the future, and if you're not there then you can be sure that your competitors will be. Don't get left behind; book today!